SYDNEY--(BUSINESS WIRE)-- SpeeDx Pty, Ltd. announced an agreement with Cepheid to manufacture their market-leading ResistancePlus® tests for use on the GeneXpert System. The first test in Cepheid’s FleXible Cartridge programme, planned for launch early 2019, is ResistancePlus® MG, detecting the sexually transmitted infection (STI) Mycoplasma genitalium (Mgen) and markers associated with azithromycin resistance. 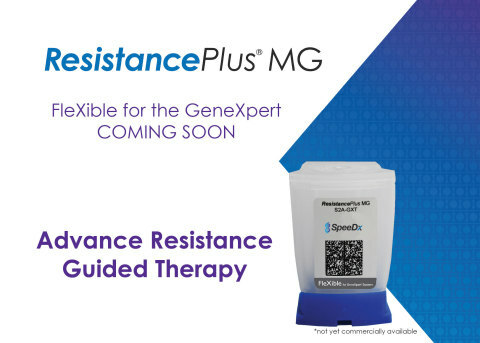 ResistancePlus MG will be the first assay available through the Cepheid FleXible for GeneXpert program. Currently, there is no FDA-cleared molecular diagnostic test for the detection of M. genitalium in the U.S. The SpeeDx ResistancePlus® MG assay is CE marked for sale in Europe and TGA approved for sale in Australia. The test provides valuable detection and antibiotic resistance information to clinicians in a rapid time frame. Timely detection of antibiotic resistant infections enables Resistance Guided Therapy for better treatment of the disease for patients, lessening the potential for spreading among vulnerable populations and combating antibiotic resistance. Based in Sunnyvale, Calif., Cepheid is a leading molecular diagnostics company that is dedicated to improving healthcare by developing, manufacturing, and marketing accurate yet easy-to-use molecular systems and tests. By automating highly complex and time-consuming manual procedures, the company's solutions deliver a better way for institutions of any size to perform sophisticated genetic testing for organisms and genetic-based diseases. Through its strong molecular biology capabilities, the company is focusing on those applications where accurate, rapid, and actionable test results are needed most, such as managing infectious diseases and cancer. For more information, visit www.cepheid.com. 1. Jensen JS, Cusini M, Gomberg M, Moi H. 2016. 2016 European guideline on Mycoplasma genitalium infections. J Eur Acad Dermatol Venereol. PMID: 27505296. 5. Getman D, Jiang A, O'Donnell M, Cohen S. 2016. Mycoplasma genitalium prevalence, coinfection, and macrolide antibiotic resistance frequency in a multicenter clinical study cohort in the United States. J Clin Microbiol 54:2278-2283. 6. Murray GL, Bradshaw CS, Bissessor M, et al. Increasing Macrolide and Fluoroquinolone Resistance in Mycoplasma genitalium. Emerging Infectious Diseases. 2017;23(5):809-812. doi:10.3201/eid2305.161745. 7. Miller WC, Ford CA, Morris M, et al. Prevalence of chlamydial and gonococcal infections among young adults in the United States. JAMA 2004; 291:2229–2236.